When you are feeling more confident, you can have the doc measure your brain age again. This time however, you are required to do three tests chosen at random. Your calculated age can go up or down and is displayed on your profile when you first load the game, much to my embarrassment. The daily training exercises are where you are likely to spend most of the time, but the package also includes Sudoku. This is a particularly nice bonus, especially considering that the Sudoku on offer here is better than many of the stand-alone Sudoku game cards available for the DS. We're sure you all know what Sudoku is so we won't bore you with the detals, just tell you that entering numbers and navigating the grid is particularly easy. Each square lets you store possible numbers before committing your answer and everything is effortlessly controlled by the stylus. 48, well, it's an improvement on 80! Finally, if you can rope in a DS owning friend, there's the download mode. Here you can test your arithmetic skills by entering a "Calculation Battle". It all reminds me a little of when your teacher used to try and make mathematics lessons more interesting by giving exciting names to long division or algebra worksheets. Whoever solves the calculations in the fastest time wins. Of course, being from the calculator generation I lose by a grand margin to most people. It's a shame there aren't a few more download play games, Big Brain Academy and More Brain Training have a much better selection. 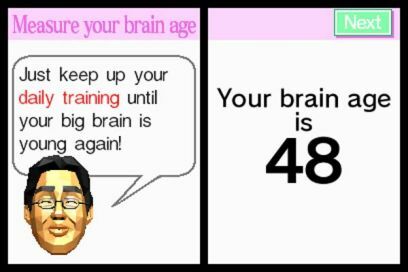 So, in spite of a few minor niggles, mainly to do with the poor voice recognition on some challenges, Dr Kawashima's Brain Training is a solid package. The games will keep older DS players occupied for many months. While not quite as good a package as its sequel, it still has enough different challenges to warrant a purchase and at half the price of regular DS games, purchasing this game card is a brainy decision!